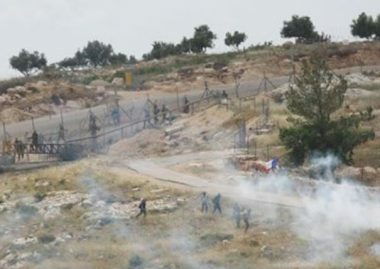 Israeli soldiers attacked, Friday, the weekly nonviolent protest against the Annexation Wall and colonies in Bil’in village, west of the central West Bank city of Ramallah, causing several injuries, and burning many olive trees. The procession started from the center of the village when dozens of Palestinians, Israeli and international peace activists marched towards the Annexation Wall, isolating the villagers from their orchards, near Abu Lemon area. They carried Palestinian flags and marched chanting for national unity, and ongoing resistance until liberation and independence, the release of all detainees and the Right of Return of the refugees. Several protesters managed to reach the iron gate of the Annexation Wall, and started banging on it in addition to writing graffiti calling for liberty and independence, while the soldiers, stationed at military towers and on hilltops filmed them. The army also fired many gas bombs and concussion grenades at the protesters and the orchards, causing many to suffer the effects of teargas inhalation, and burning trees before Palestinian firefighters rushed to extinguish it. Rateb Abu Rahma, the coordinator of the Popular Committee against the Wall and Colonies in Bil’in, called for extensive solidarity with the villages of al-Khan al-Ahmar Bedouin Palestinian community near Jerusalem, facing displacement, yet again, due to Israel’s illegal colonialist activities.